For many years the mess room has looked a little drab and uncared for. The walls were telling tales of damp and neglect, holes were littered everywhere from whence things had once been affixed, and the far corners were always dark and dreary. 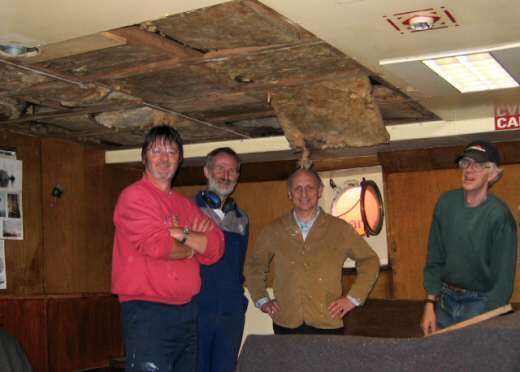 With the studio area and the bridge brightened up by a liitle TLC on the woodwork our thoughts turned to the messroom through the winter of 2005 and early 2006. In theory it sounded simple, remove the ceiling panels and take outside to strip and repaint, remove the old and rotten roof insulation and replace with new highly rated material, install some new lights and power points, check the state of the existing wiring, repair the damaged woodwork, and sand and varnish the remaining woodwork! Easy we thought. And when that's finished we can fit the new carpet tiles which were dontaed several years ago by the late Dave Francis. But three or four months later we are not so sure it was as easy and simple as we expected! John, Graham, Roland and David when the first panel had been removed. As work progressed around the ceiling we came across one or two little surprises. 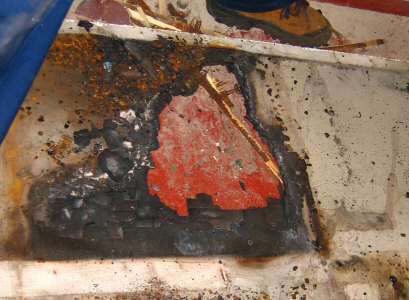 In one area of the roof void there was much evidence of quite a substntial burnup at some previous time, in the area of a long removed light fitting. 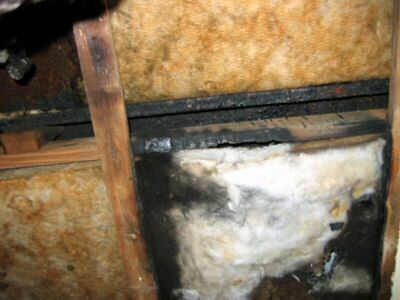 Evidence of burnup in ceiling, and the remains of the ceiling panel when the patch had been removed. 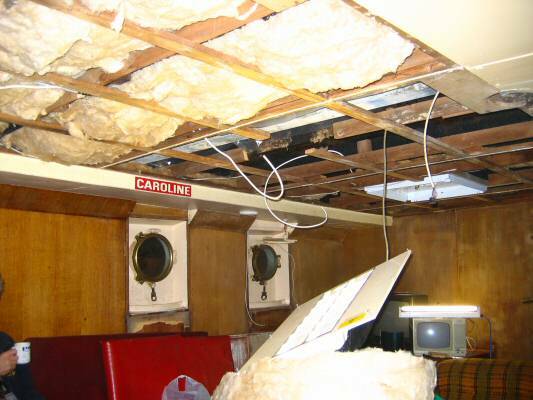 The damage is thought to have happened long before Caroline acquired the ship. 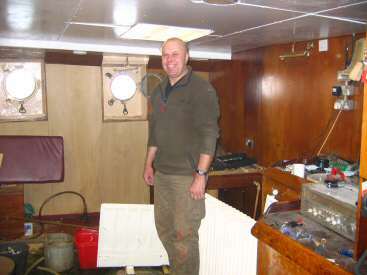 Bodges like this are found in many parts of the ship and no doubt contributed to the burnup. Although acceptable as a emergency bodge whilst at sea, after thirty or more years in a damp environment such wiring has no place nowadays. This old deteriorated, rubber insulated, lead sheathed cable is all being removed and replaced with modern low-smoke fire retartdent FP200 cable as part of the re-wiring project. Such cable is not the cheapest, but is of excellent quality and complies with numerous standards. Lee, removing some old cable tray with the angle grinder, and Graham and Lee (again) working on another part of the roof. Remarkably whilst all this work on the ceiling was taking place and the whole room was one big mess, we managed to eat from the table 2 or 3 times a day. It was not uncommon, however, to have lights dangling while we munched away. Without doubt the worst part of the mess room refurbishment was fitting the new insulation. If you have ever installed this in your loft, on the floor you will know how evil and foul the stuff is. Now, imagine trying to install it above your head! And work it in amongst the wooden frames, cable trays, air ducts, etc. Even with gloves and face masks on, we were still coughing and wheezing for the remainder of the weekend, not to mention the inevitable itching. 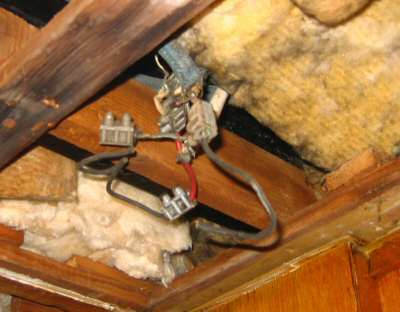 About half of the ceiling was insulated during the Christmas to New Year period, and the remainder in two or three weekends thereafter. We have all been amazed at the result though. 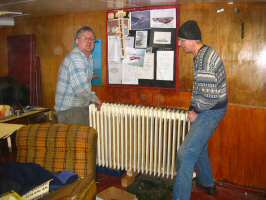 Whereas once we used to have 2 or 3 electric heaters on to make the room comfortable, now, a single 1kw heater is enough to allow us to take our jackets off even when the outside temperature is around freezing. When the heating is on, it is positively sweltering in the room, and we are now on the lookout for some thermostatic radiator valves to regulate the temperature with. First thing in the morning, when just the electric heater has been on all night with the door closed, it is actually warmer in the mess than in the generator room! Another part of the ceiling undergoing refurbishment. With the ceiling finally repainted and back in position, our Ace carpenter Steve Dack can turn his attention to the wall along the porthole side. 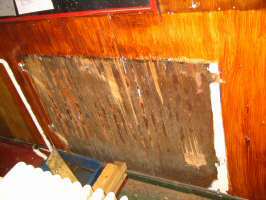 This side has always been the worse for wear, with much of the wood stained and damaged as a result of water ingress, etc. 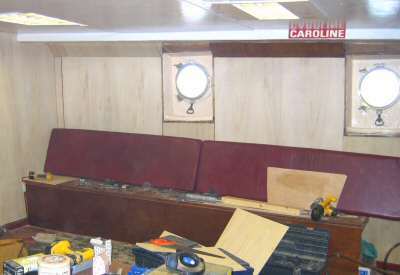 Rather than trying to patch up and repair what was left, it was decided to re-panel with a new thin sheet of veneered ply all around that side of the room. To get the new panelling round the side wall the old radiator had to be removed. We looked at various ways of removing the brackets which had been welded to the rear of the radiator, but eventually David used the tried and tested hacksaw method whilst Steve held it in place. 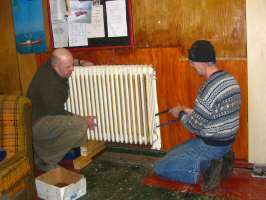 Radiators like this are heavy old lumps, so it took the combined efforts of Alan and David to shift it when the brackets were finally cut. We were all surpsied at the woodwork behind the radiator, it was in very poor condition, all the veneer had peeled off and the wood was pretty soft and rotten. 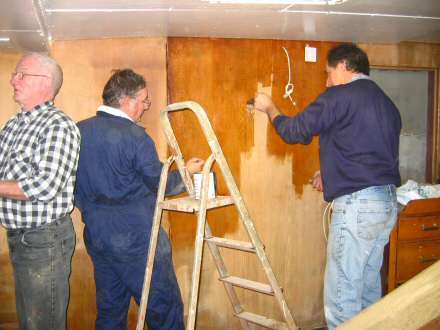 Tommy, Phil and Trevor starting to varnish the rear wall after it had been sanded and the bench temporarily removed. 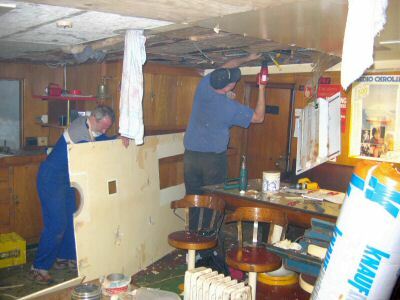 Meanwhile, whilst work in the messroom continues, and winter 2006 drags on, refurbishment has started in some of the crews cabins. We are all hoping that warmer weather will be with us later in March, and by the very latest in mid April for the Easter week so we can once again start on the outside of the ship. 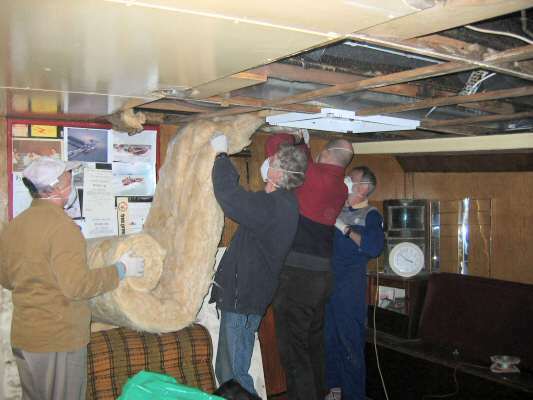 Our plan for the Easter week is to strip the starboard side of the hull back to bare metal and fully repaint, as we did with the portside in late 2005.